After a decade EFUF returned to the city of Celje for a brief visit! Find out what we’ve been up to on the second conference day in our latest blog post. Attendees of the EFUF 2016 were warmly welcomed in Celje, “the city of counts and princesses”, by the mayor Bojan Šrot. He has expressed his honour and pride in that, since first hosting EFUF in 2005, Celje has become a role model for urban forestry in Slovenia. He has been aware of the potential that developing the brand “Urban forest of Celje (Mestni gozd Celje)” can offer the city and its residents and has been strongly supportive of the efforts of Slovenia Forest Service towards establishing it. 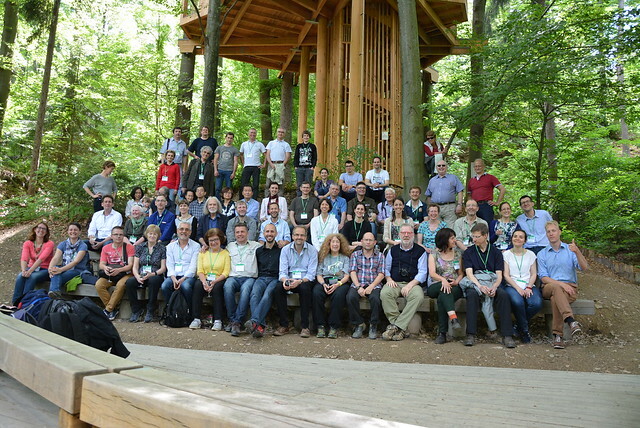 Damjan Oražem, director of Slovenia Forest Service, continued that in their unceasing endeavors they have gathered years of valuable experience that can now be passed on to other Slovenian cities. The second day of EFUF 2016 was characterized by lectures and discussions on the potential and ability of urban forests and green infrastructure in making cities and their parts more attractive and visible. This common thread was established at the very beginning by keynote speakers Robert Hostnik and Alan Simson. They expressed that branding urban forests is a long process involving a lot of cooperation, a risk that should be taken, as the rewards are bountiful and worth every effort. Their lectures were followed by many constructive presentations, offering a lot of applicable solutions and practical tools (such as lighting and different assessment tools) for making cities and their forests more visible and visited, which can highlight the many services they provide and attract further investments. It is worth remembering that “cities are like magnets – they can attract or repel”. Magnetic cities look and feel better, attract people and investments. And urban forestry has much to contribute to making our cities more ‘magnetic’, as it has the knowledge to make the urban environment a quality green environment. To achieve anything worthwhile communication and networking are essential – using any means possible to connect with authorities, stakeholders and people, and forming networks, partnerships and events to share knowledge, information and experience. After the indoor part of the Forum’s second day we went to stretch our legs a bit and paid a visit to the Urban forest of Celje and its lovely tree house – the trip was full of surprises, delicacies, good mood and… vinegar free 🙂 We shall remember our visit to Celje as a very instructive (at times even challenging) experience and fun all the same – a real treat for all of our senses!